What better way to orient yourself to a place than with some field guides? Farrar and Rinehart's Rivers of America series has profiled this region's three major rivers; the University Press of Virginia has catalogued much of its flora and fauna; and writers such as Susan Tyler Hitchcock and Jim Murray have looked in detail at their favorite features of this landscape. Blair Niles. The James: From Iron Gate to the Sea. Illus. Edward Shenton. Rev. ed. New York: Farrar and Rinehart, 1945. First published in 1939, Blair Niles's The James originally covered only the Tidewater portion of the river, but in this 1945 revision Niles expanded the book's coverage to include the entire James River watershed. Julia Davis. The Shenandoah. Illus. Frederic Taubes. New York: Farrar and Rinehart, 1945. Presentation inscription from the author. After the appearance of The Shenandoah in 1945, Julia Davis revised her popular text for publication as A Valley and a Song: The Story of the Shenandoah River (1949), a children's book, and again to complement the photographs of Lucian Niemeyer in Shenandoah: Daughter of the Stars (1994). Frederick Albert Gutheim. The Potomac. Illus. Mitchell Jamieson. New York: Rinehart and Co., 1949. The Potomac River best known to most Americans is that which flows past the monuments pictured on the cover of Frederick Gutheim's The Potomac. The lesser-known river is the "Potomac Above the Falls," the subject of his fifth chapter. Oscar W. Gupton and Fred C. Swope. Wildflowers of the Shenandoah Valley and Blue Ridge Mountains. Charlottesville: University Press of Virginia, 1979. Donald W. Linzey and Michael J. Clifford. Snakes of Virginia. Charlottesville: University Press of Virginia, 1981. Oscar W. Gupton and Fred C. Swope. Trees and Shrubs of Virginia. Charlottesville: University Press of Virginia, 1981. Useful for the amateur naturalist, these three field guides from the University Press of Virginia feature descriptions and color photographs for easy identification of unknown species. Susan Tyler Hitchcock. Gather Ye Wild Things: A Forager's Year. Illus. G. B. McIntosh. New York: Harper and Row, 1980. Published in a paperback edition by the University Press of Virginia in 1995, Gather Ye Wild Things is an eloquent field guide to edible wild plants. As Hitchcock writes in the introduction, "Gathering wild things can become a year-round preoccupation, a way of life. The landscape changes shape when you start noticing which plants grow where, which plants are good for what. Good-for-nothing backlots turn into fruitful havens. Weeds in the garden look as good as the vegetables. Forest underbrush begins to tell a story as intricate as an illuminated manuscript, once one takes the time to read it." The book is divided into four sections, one for each season, and contains 52 chapters, one for each week of the year. Virginia Society of Ornithology. The Raven 1.1 (Jan. 1930). Ed. Joseph James Murray. Organized at Lynchburg College on 7 December 1929, the Virginia Society of Ornithology has two primary aims, as Jim Murray explains in this first volume of The Raven, the group's newsletter: "to draw together the bird students of the state into a group where they may know and help one another" and "to gather and assemble data on the birds of Virginia." The title of The Raven, he says, both "gives to our bulletin the name of a bird that was once common in our state from the coast to the mountains" and "serves as a memorial to a bird which in our section is fast being driven out of existence by the advance of civilization." Joseph James Murray. A Check-list of the Birds of Virginia. Lynchburg: Virginia Society of Ornithology, 1952. 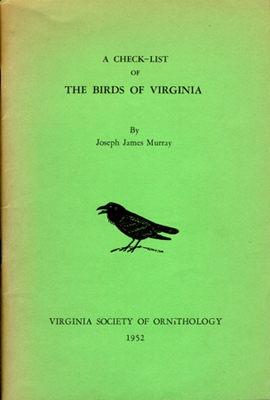 Neither a description of the birds nor a discussion of their habits, Murray's Check-list is a summary of information on the distribution of Virginia birds, the first major attempt to update William Cabell Rives's Catalogue of the Birds of the Virginias (1890). The Check-list discusses the history of ornithology in Virginia, includes a selected bibliography, and lists 398 forms, with 14 additional hypothetical forms and two hybrids. In 1936 Murray was made an Elective Member of the American Ornithologists' Union, and from 1936 to 1946 he served as Secretary of the National Audubon Society. He is also the author of Wild Wings (1947), a collection of children's nature essays that has proved equally popular among adult readers.